In this first of a new series we’ll be exploring Ireland’s Wildlife Calendar… looking at the wildlife events and milestones that occur each month on and around the Island of Ireland. Over time we hope they’ll grow into a valuable monthly reference to Ireland’s wildlife year. Enjoy… and let us know what you think in the comments below. The weather in April in Ireland tends to be extremely unpredictable. There are typically lots of showers interspersed with sunny spells, and very variable winds. Unsettled is putting it mildly — quite frankly it’s all over the place. Think “be prepared” because the weather could literally throw anything at you. Forget “four seasons in one day”… in April, in Ireland, think “four seasons in one hour” and you’ll be nearer the mark. Layers are the key to comfortable wildlife watching this month — a good insulating base layer, a decent fleece or mid layer and a high performance waterproof shell should see you through most April situations in relative comfort — although it can still get cold, so there’s no harm throwing an extra layer in the day pack, just in case. In terms of footwear remember the ground can be VERY wet and slippery in April, even if the weather is dry on the day… so wear waterproof footwear with plenty of grip. Wellies are generally a sensible all-round option. Always check the forecast (try www.met.ie for Irish weather updates — or check out the excellent AccuWeather app online or on iOS or Android on your smartphone for up-to-the-minute forecasts) and dress appropriately. April really is the start of spring, and nature is gearing up for a busy season ahead. Everything is in transition…. from emerging plants to migrant birds to breeding mammals. It’s all systems go on the wildlife front… and a great time for the intrepid wildlife watcher to get out there and enjoy nature. As an island nation marine wildlife is always high on the Irish nature watcher’s agenda… there’s a lot happening in April around our coasts… here’s a selection of the highlights. 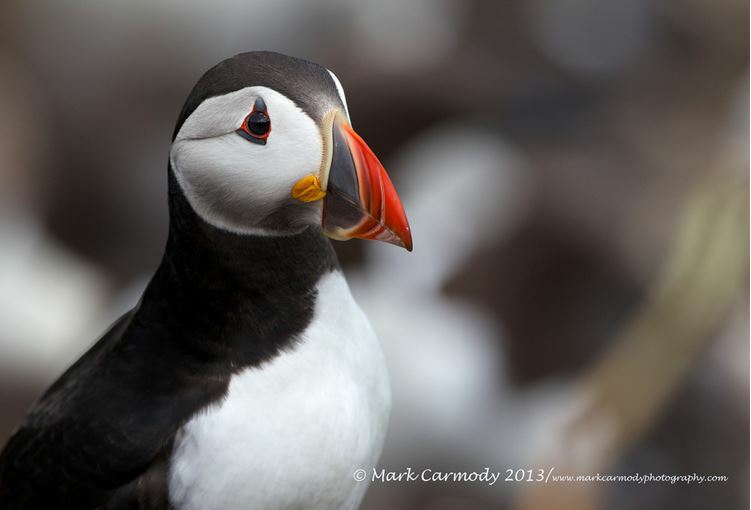 Ireland is an important breeding site for several seabird species, and many birds return at this time of year to our sea cliffs and offshore islands to raise their young. Perhaps the most iconic and photogenic of the returning birds are the puffins. They arrive in numbers to the Skelligs off Co. Kerry, The Cliffs of Moher in Co. Clare and the Saltees off Co. Wexford — and from now through summer you can get great views of these comical little birds as they go about raising the next generation of “pufflings”. Puffins may hog the limelight, but don’t forget other seabirds are also returning — guillemots, razorbills and fulmars are all kick starting their breeding season around now. Ireland also plays host to some internationally significant gannet colonies. This impressive large seabird can be seen from all Irish coasts throughout the year, but in April they can be seen congregating around breeding colonies. Ireland’s main gannet colonies are located on Great Saltee, Co. Wexford, the Bull Rock, Co. Cork and Little Skellig off Co. Kerry, with a smaller colony on Irelands Eye, Co. Dublin. Of these sites Little Skellig is the largest with over 26,000 breeding pairs and thousands of non-breeding birds every year. A visit to any gannet breeding colony is guaranteed to impress. Manx shearwaters also return to our shores in numbers in early April. You’ll be able to spot these long-distance ocean travellers, that spend the winter off the coast of southern Brazil and Argentina, passing close to prominent headlands around the Irish coast over the next few months. Sometimes literally thousands shearwaters per hour can pass your vantage points — making for an incredible spectacle. Brisk onshore wind are best for seawatching — as they tend to push the birds closer to the coast. You’ll need good binoculars or (preferably) a spotting scope to get good views. Keep an eye out for other seabirds too — great skuas (or Bonxies, to give them the vernacular Shetland name popular with birders) can pass close to shore, harassing gulls and newly arrived sandwich terns for their catch, and aggregations of diving gannets are always a great spectacle — not to mention the chance of passing puffins, razorbills and guillemots. For a closer look at some of these seabirds try taking a ferry out to one of our offshore islands. As well as the chance to get close to some breeding colonies on the islands themselves, the ferry can offer a great platform for a closer view of birds at sea when conditions are good. April marks the start of basking shark season in Ireland (Image via the Irish Elasmobranch Group). 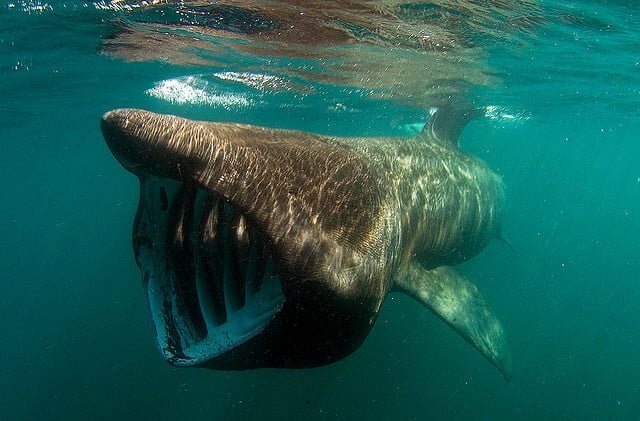 April is typically when we get the first reports of basking shark arriving around Irish coasts (generally starting from the south and working their way north). Headlands are the best places to look for them from the shore — although they often come into shallow water in bays to feed, and you can sometimes spot them from beaches. Calm, sunny days are best — although they are thin on the ground in April. If we do get a spell of settled weather it’s well worth heading for a coastal vantage point to look for these magnificent creatures. Binoculars or a spotting scope, if you have access to one, will improve your chances of spotting the prominent black dorsal fin, the tip of the tail and sometimes the tip of the snout breaking the water’s surface as these giants hoover up tiny plankton at the surface. Check out this dedicated feature for tips on making the most of spring migration in Ireland. While a few intrepid individuals arrive back in March, the bulk of our summer breeding birds turn up from early April onwards. Look out for the usual suspects: wheatears, sand martins, house martins, swallows and swifts across the country this month. Cuckoos also typically arrive during April — and although they can be tricky enough to see it’s worth listening out for their distinctive eponymous call. You’ll also start to hear and see our visiting warblers again — look out for increased chiffchaff and blackcap activity as overwintering visitors make their way north and our breeding birds arrive back to take their place, singing with gusto to reclaim their breeding territories. Willow warblers, sedge warblers, and grasshopper warblers will be hot on their heels. On the coast look out for arriving terns… sandwich terns first, then common terns, arctic terns, little terns and (if you’re really lucky) roseatte terns. There’s always a chance of picking up more unusual birds at this time of year as they pass through Ireland on migration. 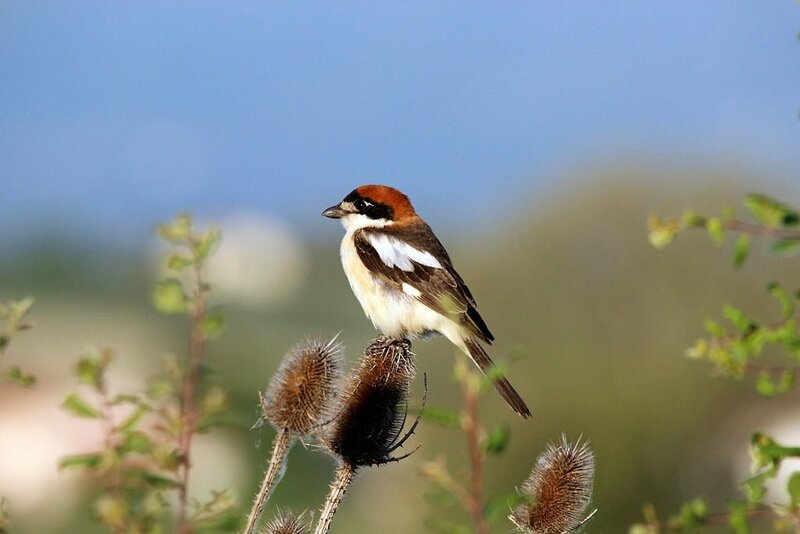 Birds on passage can turn up anywhere, but coastal sites are best, especially headlands, as they tend to be the first bit of land migrating birds see after crossing a large expanse of ocean. Mid to late April is a great time to get out and about on your local headland, checking patches of cover and to see what might be stirring. Don’t forget to look up from time to time to check for larger birds passing overhead. Possible rare spring highlights that occasionally turn up in Ireland include osprey, hoopoe and woodchat shrike. Our resident birds have a head start on their travelling cousins, and their breeding season is already in full swing. April is the month when you’ll start to notice them shift into high gear… with more frantic breeding activity, ceaseless singing and birds busily defending territories, collecting nesting material, sitting on eggs and even feeding young. You should see increased activity around your garden nest boxes now as pairs of familiar garden birds take up residence and get busy rearing the next generation. Our mammals are also busy in April, kick starting their breeding season after the long hard months of winter. For those active all winter the breeding season is well under way. The fox typically give birth to cubs in March and April, and most breeding vixens will have young underground by now. Badger sets will be active again after a quiet winter — with evidence of “spring cleaning” as adults clear out winter bedding and replace it in readiness for the imminent arrival of this year’s young. 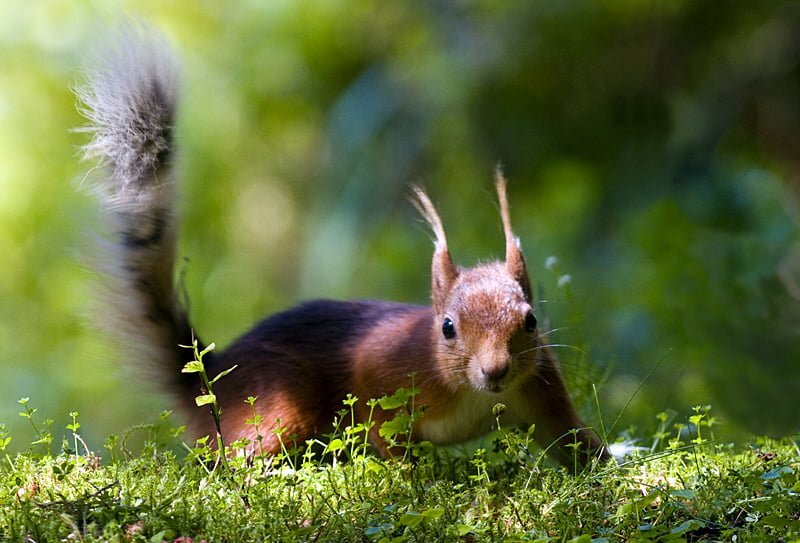 Squirrels are also more active as the weather slowly warms… so look out for signs of our native red squirrel in woodland — particularly conifers. It’s also worth keeping an eye out for pine marten in similar habitat at this time of year — although they are very hard to see. April can be a good month to catch a glimpse of the elusive Irish stoat. These charismatic little hunters are relatively common, but are tricky to spot. With ground vegetation still relatively sparse, you have a better chance of seeing this fast moving, long-bodied mustelid as it hunts among grass and undergrowth for its small mammal prey. Stoats are fond of the nooks and crannies around drystone walls — which can be a good spot to look for them. Irish hares are also conspicuous in April as they increase their daytime activity. Look out for them on open meadow, pasture or moorland early in the morning or late in the evening. Dublin Airport long stay car park is a hotbed of hare activity — so keep your eyes peeled if you’re going on a trip. If you’re walking cross-country you may be lucky enough to come across a leveret (baby hare) safely ensconced in a hollow in the ground (known as a form) where it stays hidden from potential predators. It’s not lost or abandoned — leave it be its mother will be back to care for it when the coast is clear. With temperatures warming, and insects emerging bats stir from their winter torpor and start leaving their winter roosting sites to feed and scout potential maternity roosts. You may see them on warmer April evenings, silhouetted against the darkening evening sky. If you have access to a bat detector this is a good time to check / recharge the batteries ready for the upcoming bat season. Common pipistrelle and soprano pipistrelle are the most commonly encountered of Ireland’s nine confirmed bat species. Frogspawn laid in January or February will have hatched by now, so look out for tadpoles in any ponds and ditches you encounter. 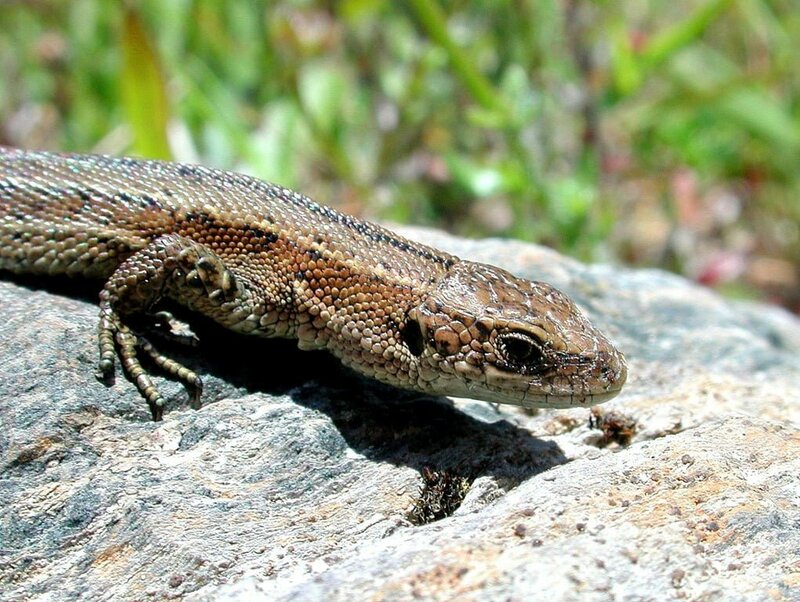 Common lizards… Ireland’s only land reptile… should have emerged from hibernation by now — so look for them sunning themselves on walls, rocky areas and logs during fine spells. Insects are well and truly out and about now, the slowly rising temperatures triggering them into activity. The hum of bees returns — with several bumblebee species on the wing and a number of solitary bees and wasps. Later in the month, on warmer days, you may see clouds of “dangly-legged” black flies hanging in the air — these are St. Mark’s Fly — and funnily enough turn up seemingly out of nowhere on and around St. Mark’s Day on the 25 April. Several spring butterflies are on the wing in April. Notable species to look out for this month include the orange tip, small tortoiseshell and brimstone. Moths are also on the wing — and you can check out what’s flying near you with the aid of a moth trap (or even a white sheet and a table lamp, at a pinch) and a good moth field guide (be warned… mothing can be addictive… and while some species are straightforward enough, moth ID is certainly not for the faint hearted). Plants are growing like crazy as longer days and (hopefully) more sunshine fuel their development. 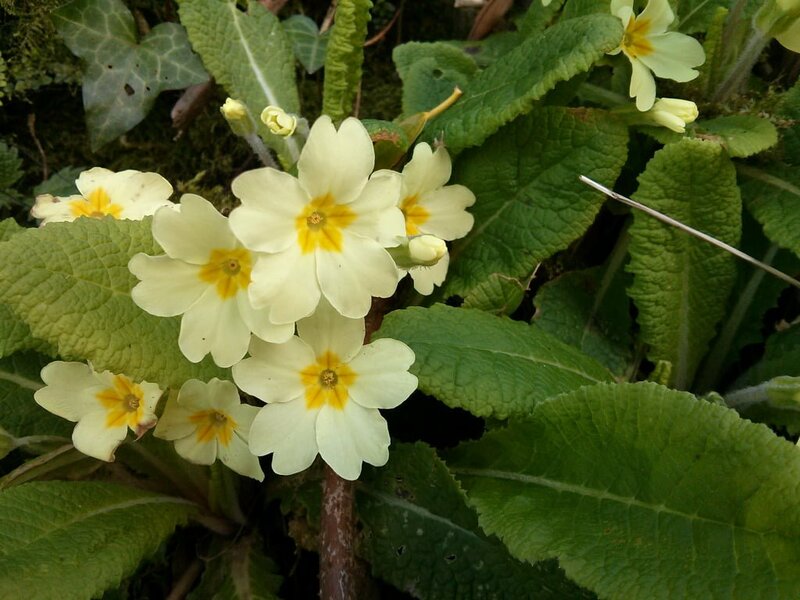 Early flowering plants like primrose and wood anemone are in bloom, and everywhere hedgerows and meadows are bursting into life as plants shed the dormancy of winter and make up for lost time. Ramson (wild garlic) and three cornered leek start to flower, filling the air with the scent of onion — especially where they carpet the ground and leaves become bruised underfoot. Many Irish wildflowers bloom in April — you’ll find details on the Wildflowers of Ireland website by following the link. Don’t forget to give us your hints and tips on what to look for in April — and likely locations for wildlife near you — in the comments below, and keep us posted on all your wildlife sightings over on the Ireland’s Wildlife page on Facebook. Zoe Devlin’s plant list is fab too! Thanks Dee — great to get the feedback… and thanks for the tweet, much appreciated :-). Agree – a great read – your enthusiasm shows through. Looking forward to next installment. Thanks Padraig… great to get the feedback… May’s instalment is “in production” and will be up on the site soon.